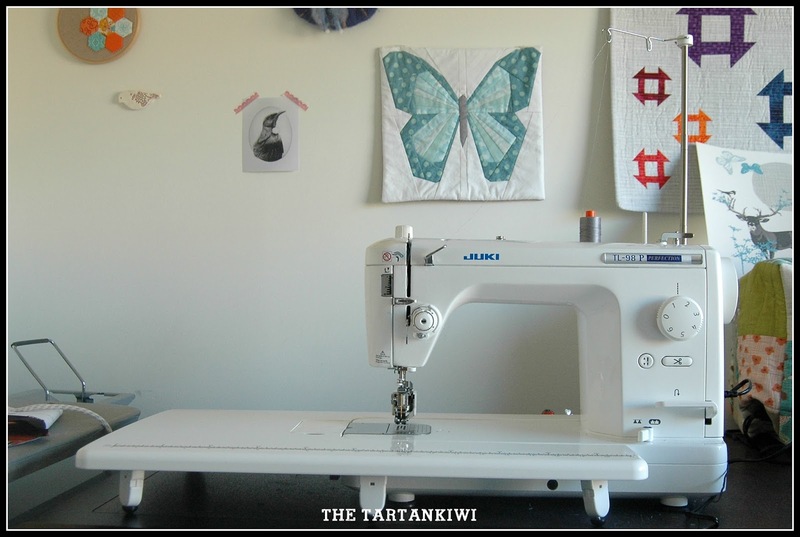 The first thing that you notice about quilting on the Juki TL-98 is that you have room to work. The harp space is a massive 8.5" x 6". 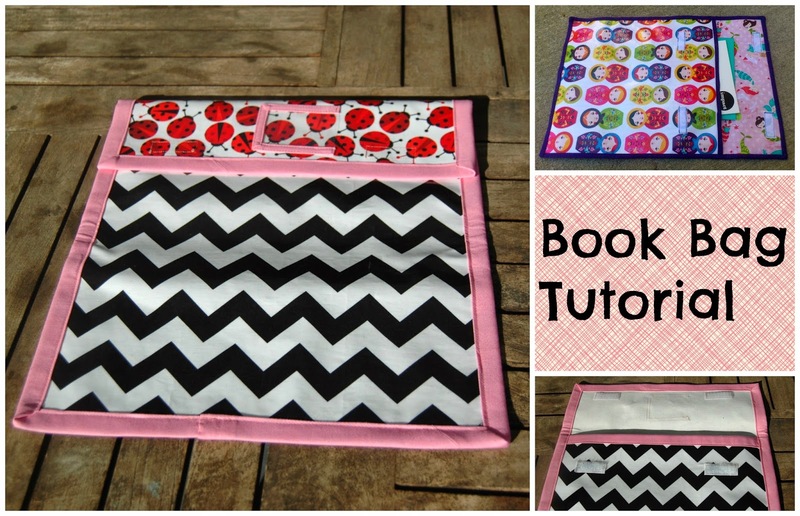 This means that you don't have to cram your quilt through a tiny space and that you actually have space to work. The following photos contain the same small cuddly dog which has been included to illustrate the scale of the machines. Please note that I deliberately photographed my old machine from the back and have blanked out the make and model details as this post is not meant to complain about its deficiencies, but to show the advantages of the Juki. My previous machine had a curved base which made it hard to feed fabric through and keep your sewing straight. 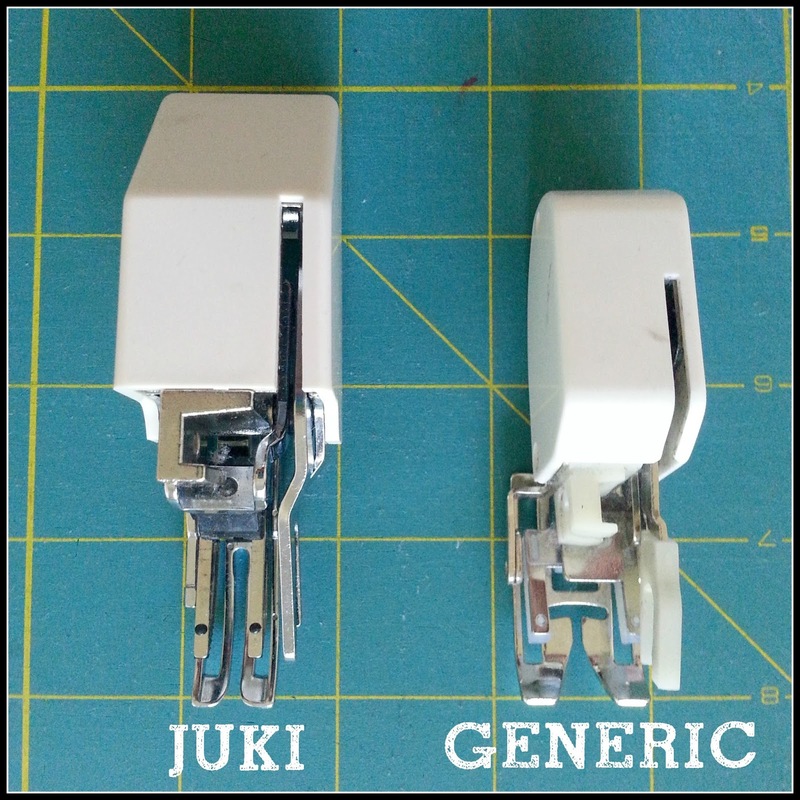 I am finding the Juki's flat base a marked improvement and I love love love the extension table. It's such a luxury to have a good flat surface to work on when quilting giving me the room to move the quilt freely without stopping to reposition my hands every 2 seconds. My old machine didn't come with a walking foot, but I bought a generic walking foot for it. I was happy with it for a while. I remember the satisfaction when I bought it, I was amazed that it could move fabric that previously stayed jammed in one place. I pretty much assumed that a walking foot was a walking foot and there wouldn't be too much difference between them- Boy was I wrong! Moving on to the Juki walking foot feels like a move of equal magnitude. 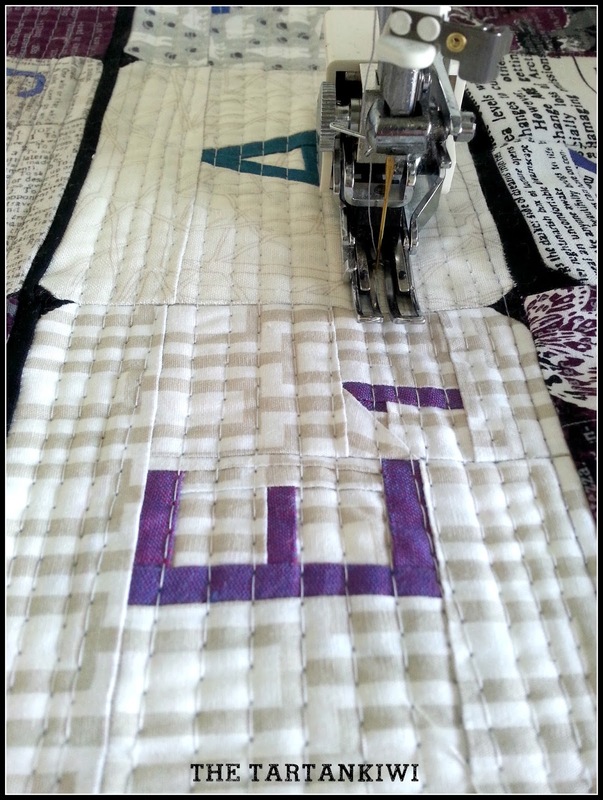 Where the achievement of my old machine and walking foot was to be able to move thick quilt sandwiches, the achievement of my Juki is to be able to do it beautifully. It runs over the bulkiest of seams with a smile on it face and not a moment of hesitation. The stitches always remain beautiful and even (unless I do something stupid!). When I straight line quilted with my previous machine, the stitches were never even. 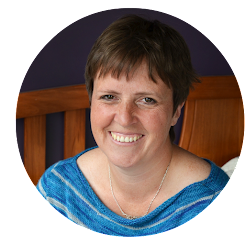 In order to sew with an even stitch length you needed to sew at an absolutely steady pace, avoid all variations in the bulk of your quilt sandwich and keep your fingers crossed, stick out your tongue, tilt your head at just the right angle and pray! Needless to say I never managed to do all of these things at the same time so the stitches in my straight line quilting were a mess! This is not the case with the Juki. The Juki is heavy. It is strong and to use a technical term it has lots of "grunt". It is able to power over bulky paper pieced seams without a problem. The walking foot and sewing machine workings are metal (not plastic) and this adds to the strength of the machine. My stitches are consistently straight and even, it makes me ridiculously happy! A hint as to why the Juki's walking foot can do so much more can be given when we compare the feet. Just look how much bigger the Juki's foot is! That extra size equates to power. The metal mechanism is far superior to the plastic of my old one. I love that the metal prongs of the walking foot are not wide and bulky. It was virtually impossible to create a consistent 1/4" seam using my old foot as it was so wide that to sew a binding on using the walking foot meant that half of the side of the foot needed to hang over the edge of the quilt bundle. The Juki walking foot is 1/4" and as such attaching binding neatly becomes significantly easier- another thing to love! 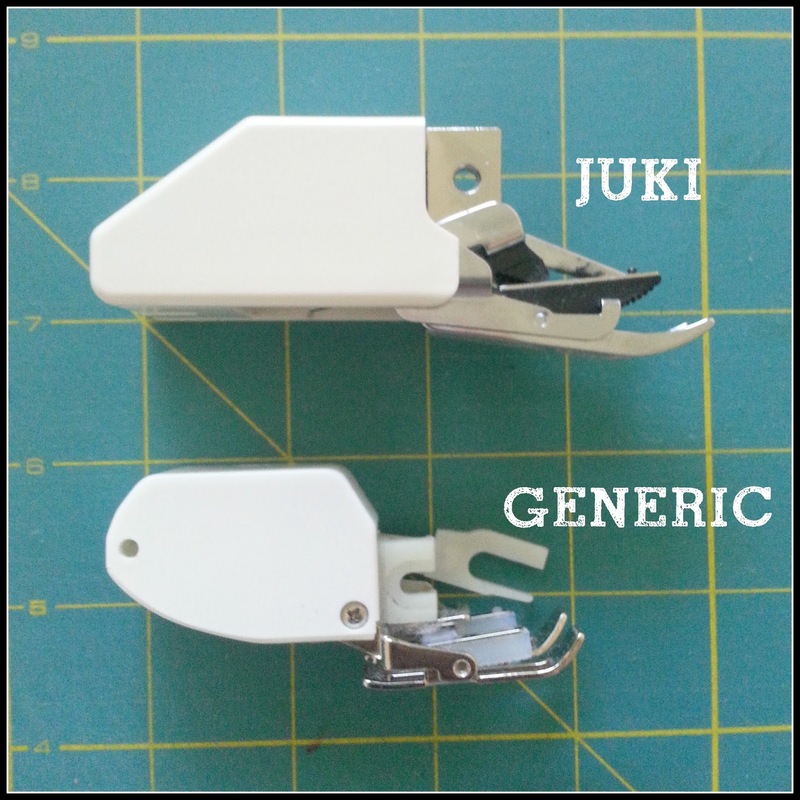 This posts is the second post in my series of posts on my new Juki TL-98P. You can find the first post here. my walking foot isn't that narrow, unfortunately it looks like that's only a TL-98 feature. I still have to try out my walking foot, but loving everything I've tried so far. Uhoh... she sounds like a dream! It's sounding pretty good. Love the bear pictures, too cute!